The opponent received Donetsk as one of the leaders (2nd place, 20 meetings, 40 points), having won in the last two rounds with an aggregate score of 4-0. Shakhtar (4th position, 19 matches, 34 points) approached the meeting without defeats in the spring part of the tournament. In the first round, a minimal victory (1-0) by the Orange-and-Blacks through a goal by Yefym Konoplia. Compared with the previous match against Vorskla (5-0), Serhii Shyshchenko made only one substitution: instead of the Shakhtar U21 Dmytro Topalov, he fielded Illia Putrya from the off. Due to cold, Vladyslav Kuzmenko and Kyrylo Melychenko were unable to help the teammates. Due to severe weather conditions, they transferred the game from KSK Holovkovskyi to the synthetic field of the Nika stadium. The beginning of the match saw the hosts play more actively. In the 5th minute, Vadym Hranchar fired a threatening shot on goal vs Vladyslav Vertei, still missing the target. It took the Pitmen some time to finetune their performance. The Oleksandriia side acted fairly tightly, meeting the Donetsk team in midfield and allowing them to create next to nothing. The Orange-and-Blacks managed to open the opposing defence in the 27th minute. Andrii Kulakov found himself one on one with the goalkeeper, but Yurii Havrusevych rescued his team. Continuing to increase the pressure, the players of Shakhtar soon achieved their goal. After the excellent pass by Oleksii Kaschuk, Illia Putrya approached the Oleksandriia goal and, covering the ball with his body from the defender, he easily outplayed the goalkeeper. The lads of Serhii Shyschenko did not stop there, continuing to have the territorial and performance advantage, with more passes getting through into the open spaces. Nevertheless, in the 42nd minute the hosts managed to equalize in one of the counterattacks – Yaroslav Dovhyi scored. However, already in the time added by the referee to the first half, the Pitmen managed to score the second goal. Illia Putrya found with a fine pass Andrii Kulakov, who had been fouled upon by the Oleksandriia keeper, with the referee pointing to the spot. The team captain Illia Putrya scored from the spot. After the break, the game pattern did not change, with the Pitmen dominating possession. On 57 minutes, Khachaev could have scored, but the goalkeeper was backed by the defenders intercepting Murad’s shot. Shortly afterwards, he and Oleksii Kaschuk shot from afar – just a bit wide. In the 67th minute, after one of the few attacks of the hosts, the score got even. 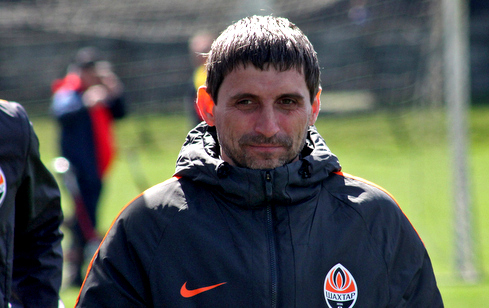 The referee awarded a spot kick vs Shakhtar for a hand ball, which was converted by Hadji Murad Lachinov. On the emotional rise, the players of Oleksandriia tried to seize the initiative, but the Orange-and-Blacks did not allow that and netted the third goal in the 79th minute. Volodymyr Yakimetssplendidly struck from set play, sending the ball low into the corner. A very short time passed, and the Donetsk side scored again. This time, the initiative belonged to Andrii Kulakov: Shakhtar striker attacked several opposing defenders, after which he decided to fire an unexpected shot from long range. This goal was the third for the striker in the three spring matches of the season. Kulakov also took part in scoring the last goal in the game. It was after Andrii's attack that the goalkeeper of Oleksandriia cleared it off for Andriuschenko, with Maksym being immaculate. 5-2 – the lads of Serhii Shyschenko claimed a deserved victory. The next meeting of the Pitmen will be held on April 26. In the missed match of the 20th round, the Orange-and-Blacks will meet with Arsenal-Kyiv away. - Today it was, perhaps, the most difficult of the three matches held this spring. Oleksandriia are going in the second spot, and we were seriously preparing for the meeting with these opponents, analyzing their performance. In the opening 15 minutes of the encounter, we and the opponents looked a little at each other, so the forces in the beginning were equal and challenges took place mainly in midfield. And only then we had chances, the guys felt confident, they began to interact better and use the space provided by Oleksandriia. It's a pity that we didn’t use the chances available. The second half was somewhat similar to the first one: the same uncertain start and effective ending, when we scored three goals. Overall, we are very happy that we have won. It’s very important for us. Yes, something worked, something else did not work, but I am pleased that we managed to bring the game to a positive outcome. Performance? We are working on this component, as well as paying due attention to our defensive operation. I am glad that our work yields fruits and we deliver prolific football. But I'm not flattered, we have problems, which, naturally, we try to solve and correct. The main thing is not to repeat our mistakes. I'm also pleased with the way the guys perceive everything, how they prove themselves in training and in games. This, in my opinion, brings us the result.